If you saw Black Panther, then you probably left the theater screaming, “Wakanda forever!” The movie more than lived up to its hype. And even if you haven’t seen it (yet), you may have noticed the stars on the 2018 Oscars red carpet doing a particular pose or handshake. Featuring arms crossed against the chest, the Black Panther handshake is a new unofficial greeting. While Black Panther wasn’t eligible for any awards this year, it’s almost guaranteed to be nominated at next year’s Oscars. The amazing story, costume design, and even its showcasing of the beauty of natural hair left us in awe. But the film also left us with a new way to greet the people we love, like, and those who understand and embrace the power of this film. The Wakanda salute has taken over. We first see it in the film when T’Challa (played by Chadwick Boseman) greets his sister, the intelligent Princess Shuri (Letitia Wright). It’s a lighthearted moment between the siblings, and we see the salute again when T’Challa greets his people. It’s a sign of strength and solidarity. But who knew it would become an offscreen phenomenon as well? 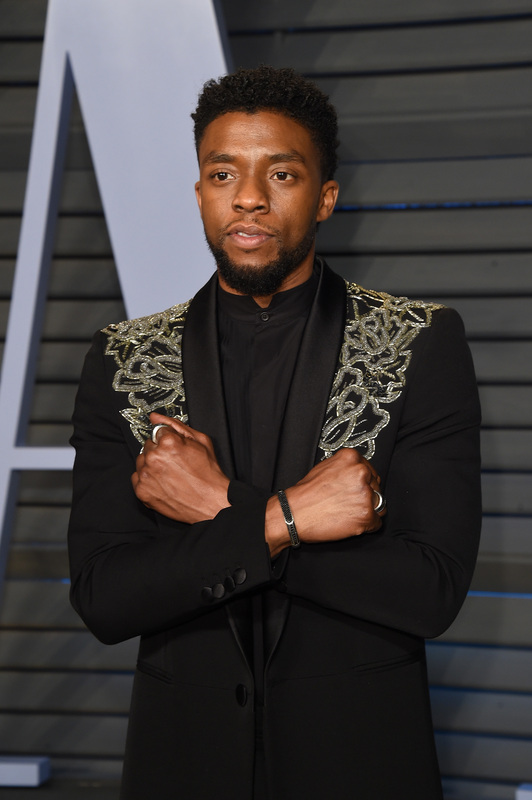 Boseman hit last night’s red carpet for the 2018 Oscars and of course, he saluted the crowd. You can do the pose on your own or make it a group effort and have a tri-salute like Black Panther stars Lupita Nyong’0, Danai Gurira, and Winston Duke. The following slow-mo shot from last night’s Oscars is just perfection. In the same way that Black Panther isn’t just a movie but a movement, the salute has also been impactful. Teachers are even using the Black Panther handshake as a way to connect with their students. # Dayton Dunbar class of 01 # HBCU Graduate!! Central State University??? If that shake doesn’t get you pumped to take on the day, then nothing will.